The theme this month is Trick or Sweet. Since I don’t celebrate Halloween I decided to go with Sweet. I’ve got baby on the brain of course, being almost 7 months pregnant, so a baby shower favour seemed like a no brainer. And I won a TE baby set a couple months ago making it even easier! If you don’t visit my blog on a regular basis you may want to subscribe or visit again as I will be doing a tutorial on how to make this favour. It’s pretty easy but I’ll list the sizes of circles to use and the measurements of the sleeves etc. You can get two from each sheet of 8.5×11” cardstock. I would have used blue and white jelly beans but I didn’t have any so this is filled with a roll of unwrapped Sweet Tarts minus the pink and orange ones. You could use any candy you want of course. Blue and white M&Ms could be cool too. Or blue FIZZY BATH SALTS would be a calorie-conscious option. They are easy and pretty cheap to make, just click on the highlighted text above. If you are very observant, you may have noticed a little blue paperclip sticking out from the side of the sleeve. I wanted to be able to undo the favour and allow it to lay flat to make a template later so I used paperclips to hold it together temporarily while I photographed it. I used stars from two different sets, Hanging Out and Bringing Home baby, cut them away from the other stamps they were attached to and used them to background stamp the onesie. The sheep and turtle were cut apart from their stamps too. I hope if you enjoyed this project you will visit again! Paper: bashful, brocade blue CS-SU! 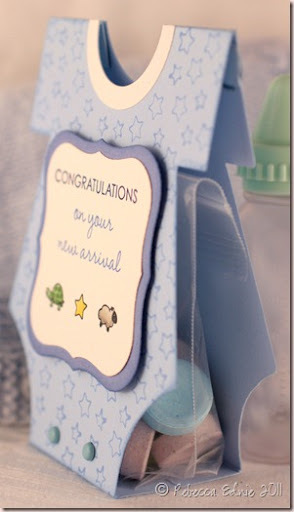 What a sweet idea for a baby shower favor!! 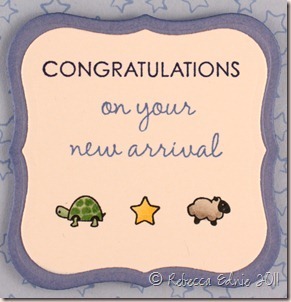 Congrats and best wishes on your little one! This is absolutely DARLING!!! Such a cute idea! Thanks for the inspiration! What an adorable project…your little onesie is sooo cute and how fun to make it into a treat holder!!!! So fun! 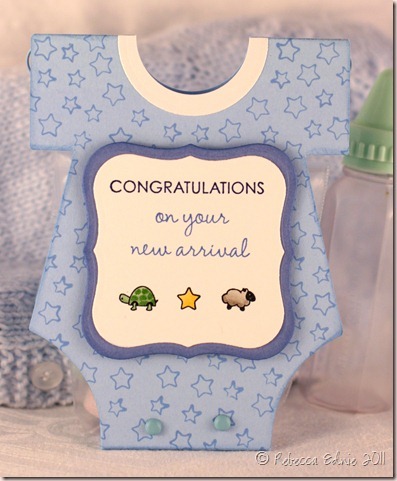 I love that favor and wish I'd had those for my baby shower! Wishing you health and good rest during the rest of your pregnancy! This is very adorable. I've never participated in Halloween either but my card today was one of the first Halloween cards I've ever made, but made it without using Halloween stamps. What a cute project!! The treat holder is just awesome. Love the idea!! This is so clever–I love how you designed this to stand up and hold the treats! I'm subscribing now! :)Chris L.
This is WAY adorable! LOVE LOVE LOVE how you made this a favor! 7 months prego! Congrats!! LOVE THIS!!! this is just too adorable. TFS!